Carpaccio Di Manzo – A meal that starts with truffles is off to a great start. As we are in the middle of truffle season, we did just that with the special carpaccio with melted fontina cheese and shaved black truffles. The fontina cheese was light and everything just melted in the mouth. 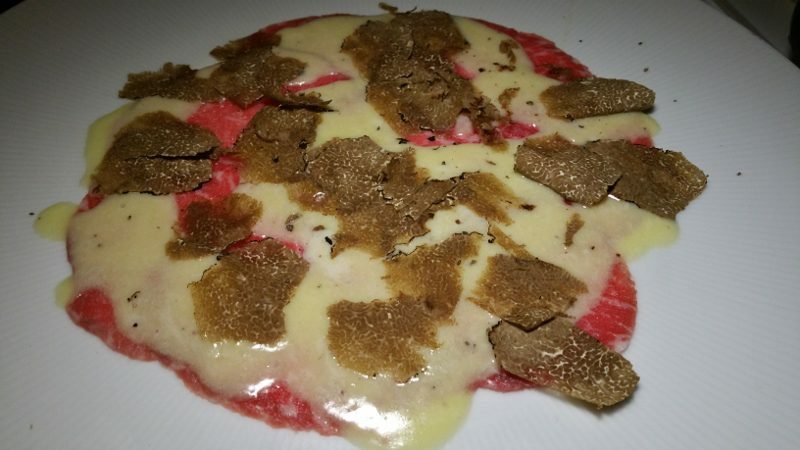 The flavors of the carpaccio and cheese are subtle and the aroma and flavor of the truffles jumped off the plate. 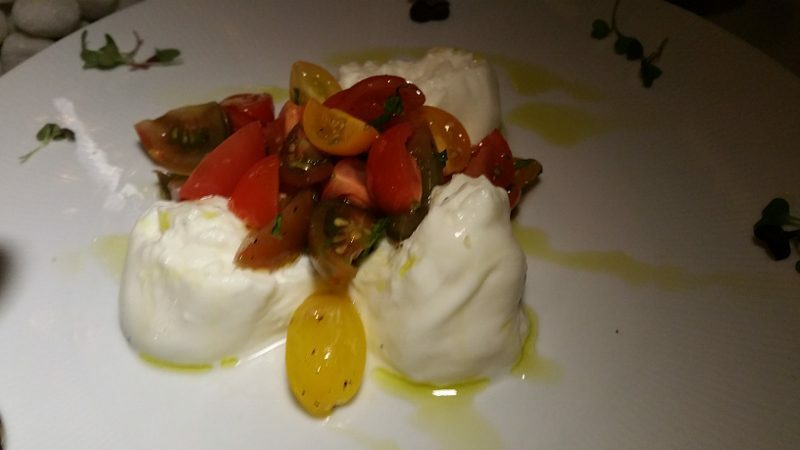 Caprese con Bufala – The caprese with buffalo mozzarella, baby heirloom tomatoes, basil and EV olive oil is a very classic Italian dish. But, when the mozarellla is like butter and the tiny tomatoes are bright with flavor, this simple dish is anything but. 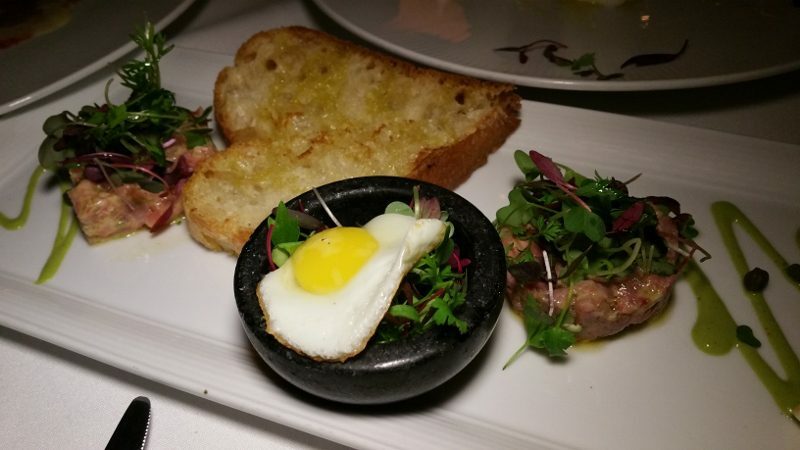 Duo of Tartars – Instead of the beef tartar, we enjoyed a duo of tartars, one beef and one veal, with a quail egg in between. The veal is a little lighter and more delicate in flavor than the beef but I would be hard pressed to pick a favorite. 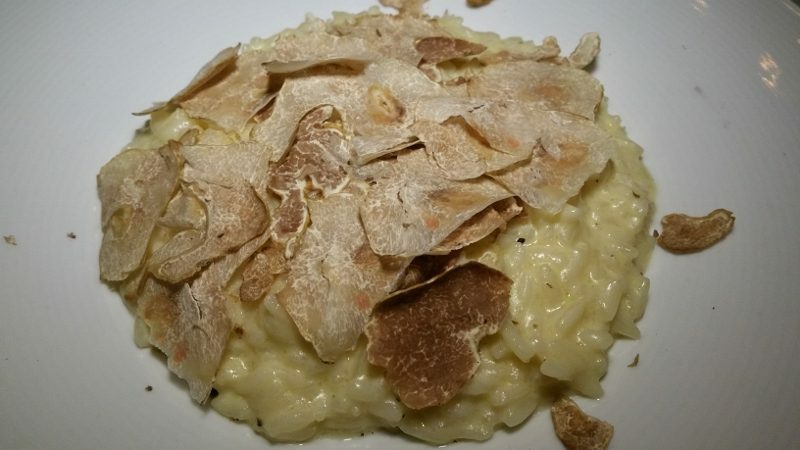 Risotto with White Truffles – If I had to pick just one dish as the standout, it might have to be the risotto with white truffles. It is probably because of the white truffles, the rare, expensive jewel that they are. But, the risotto was also cooked to perfection. Using acquarello rice, it was al dente, creamy, rich and pure decadence. 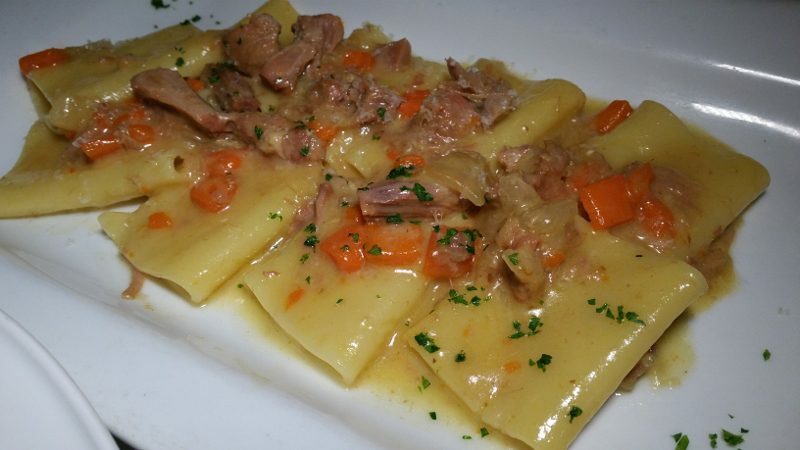 Paccheri Alla Genovese – Paccheri are large tubes of pasta that are a Neapolitan tradition. It is the perfect vessel to deliver sauce. In this dish, the sauce is braised veal shank that is tender to the touch with onions and carrots that have been sauteed in white wine. 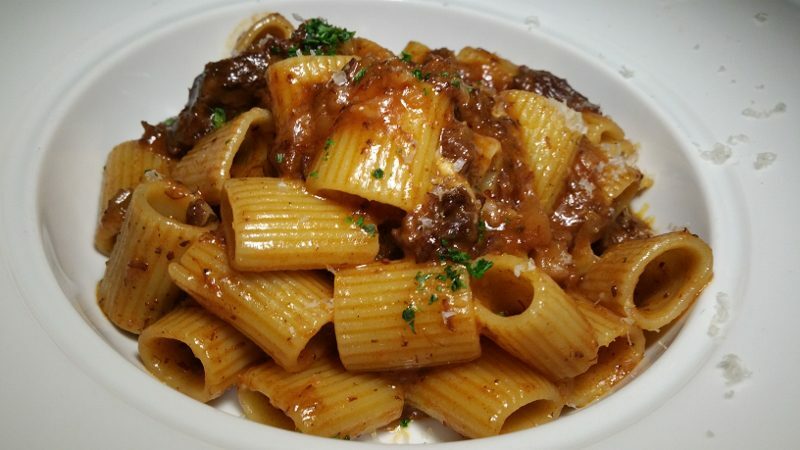 Rigatoni with Beef Cheek Ragu – The 1/2 sized rigatoni is served with a beef cheek ragu, parsnips and Barolo wine and is rich and hearty but not a heavy dish. Perfect for a colder evening, this dish is from the specials menu. Costelette Di Cervo al Funghi Porcini – As this dish was served, we initially thought it was lamp chops but in fact it is New Zealand venison chops with a porcini mushroom sauce. 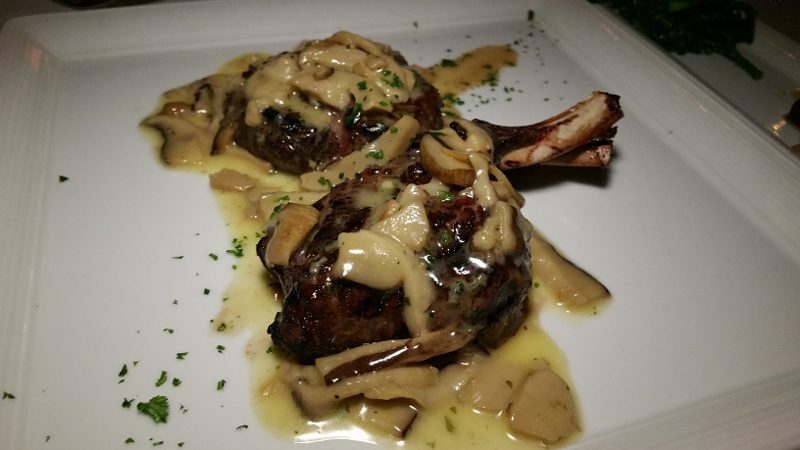 The meat was exquisite with a slight char on the outside of the tender meat. And, to my surprise, the meat was not the least been “gamey” but rather had a delicate flavor. 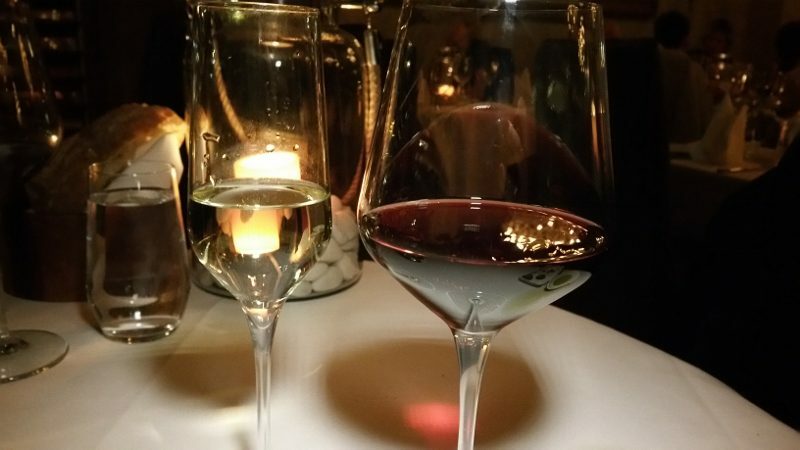 As we enjoyed all of the dishes, we also paired them with wines. With by the glass options, we were able to start with Col De Salici Prosecco di Valdobbiadene Superiore and then moved on to the Fattoria del Cerro Vino Nobile di Montalcino 2011 Toscana (enjoyed with the duo of tartars and risotto), followed by Carossa Nebbiolo 2012 Piemonte (paired with the two pastas) and ended with Cain Cuvee Cabernet Blend NV Napa Valley (for the venison). 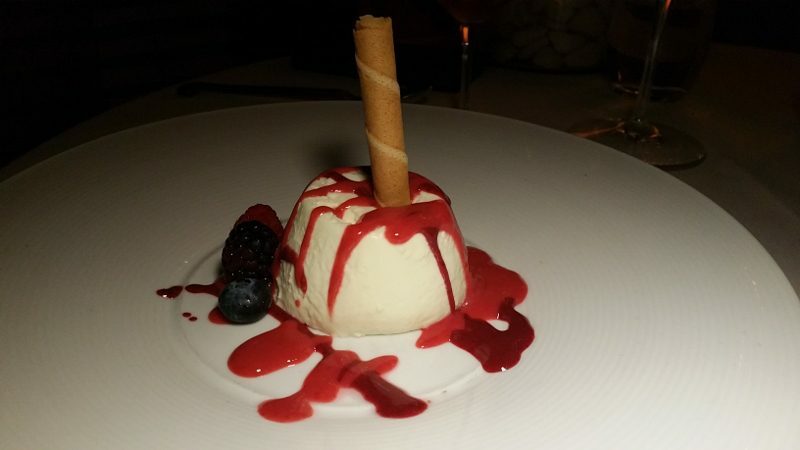 The meal would not be complete without dessert, which was enjoyed with the Pellegrino Passito di Pantelleria, a dessert wine from island of Pantelleria in the south of Italy and made from Moscato grapes that are picked and dried in the sun before crushing. 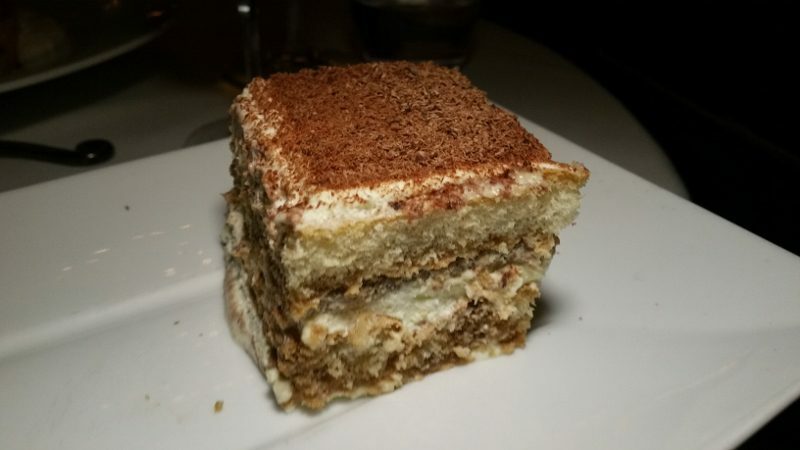 Like most Italian desserts, the panna cotta, tiramisu and sbriciolata (a cake with Nutella and ricotta) were not too sweet and the acidity and sweetness of the wine paired nicely to finish off the night. 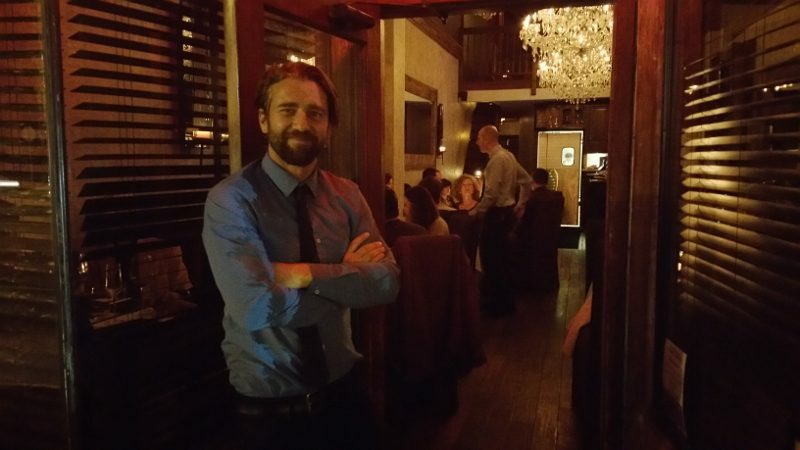 If you are looking for a delicious, authentic Italian meal in an intimate setting, look no further than Via Veneto. 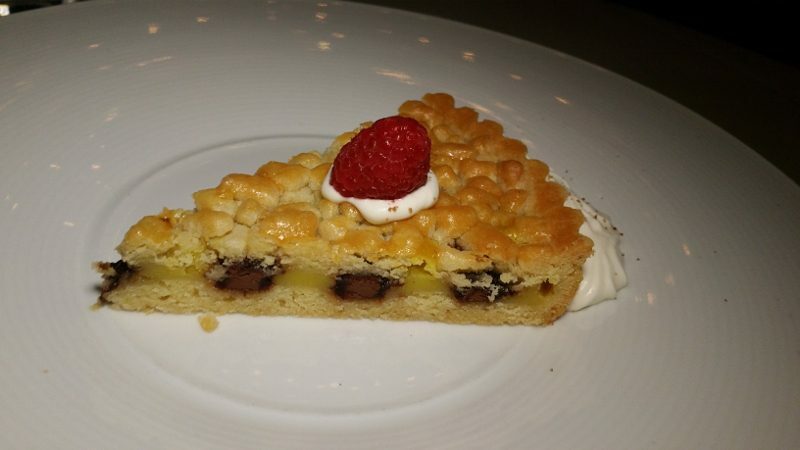 This entry was posted in Food and tagged carpaccio di manzo, Costelette Di Cervo al Funghi Porcini, dessert, food, italian food, Italian restaurant, Main Street, paccheri alla genovese, risotto, Santa Monica, Via Veneto, white truffle, Wine by Allison Levine.